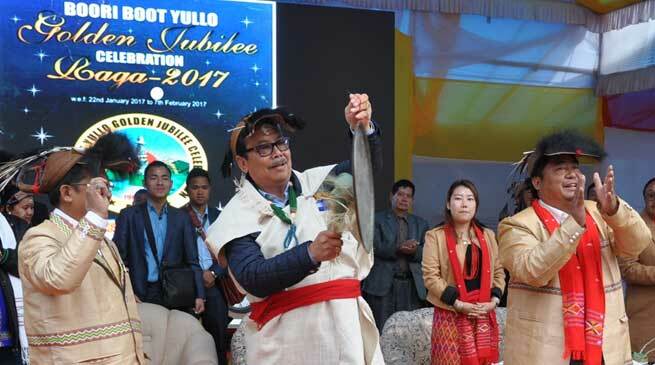 Deputy Chief Minister, Chowna Mein who attended the opening ceremony of the Golden Jubilee Celebration as Chief Guest expressed happiness to be associated with historic moments of the Boori Boot Yullo Festival. He saluted the pioneers of the festival for their visionary initiatives 50 years back and for creating such platforms to keep the aged old cultures and traditions alive. He said that a legacy has been transferred to us and we have the responsibility to pass it on to the next generations. He said, “it is our duty to protect and preserve our identity”. He said that our state has huge potentials in agriculture and allied sectors and urged to harness these potentialities. He informed the gathering that the Agriculture and Road Communication has found preference in this year’s Union budget that was presented today by the Union Finance Minister. He expressed hope that this strategically located state would also be benefitted from the budget as the state govt is also giving top priority in road communication. He assured to provide fund for the approach road, the infrastructure development and for construction of the retaining wall of the newly developed Jubilee Ground. Bamang Felix, Minister for PHE & WS while attending the occasion as the guest of honour called upon the people to celebrate the Festival to protect and preserve God’s Creation on earth. Saying that God has bestowed us with the abundance of Nature’s bounty, it is our duty to protect and preserve it for maintenance of ecological balance. He said that Golden Jubilee is a time to introspect whether we celebrate the festival in a destructive or constructive way. He also said that to practice a particular religion is an individual rights and choice but the culture is our identity. The Minister, who follows Christianity said that preservation of age old culture is a collective responsibility and appealed people not to mix religion with culture. Local MLA ,Tamar Murtem in his speech expressed thankfulness to the Deputy Chief Minister and the Minister for coming to Raga by road to attend the festival despite bad weathers. He requested the Deputy Chief Minister to provide fund for construction of approach road and infrastructure development of the newly developed Jubilee Ground. Komri Murtem, Chairman and Ranjon Bini, General Secretary of Boori Boot Yullo Golden Jubilee Celebration Committee 2017 also spoke on the occasion. An Audio Cassette, “Doma Lachin Morum Lo” produced by Er Ajay Murtem & family and a Documentary Show “Abo-Tani Duyii” and a slide show CD on “Glimpses of Boori-Boot Yullo since 1967” produced by BBYGJCC 2017 were also released by the Chief Guest and Guest of Honour. Prizes of of Boori Boot Yullo Golden Jubilee Idol winners were also given away on the occasion. Balo Demo won the BBYGJ Idol while Hipu Joseph and Kabak Miku were the first and the second runner ups respectively. Punu Display, Mega Dance, Bohain Tennam by Raga Senior Citizens and Beauty Contest were other attractions of the festival besides food stalls and other cultural programmes. The Chief Guest also inaugurated the Food Stalls on the occasion. Earlier, the Deputy Chief Minister inaugurated the newly constructed two-storied RCC building of Circuit House at Raga. Talo Mugli, Former Minister, Nido Pabitro, Former MLA, Ligu Tacho, Former APPSC Chairman, Kemo Lollen, DC Lower Subansiri and Tage Habung, SP also attended the festivals besides peoples from all walks of life.